This week saw parliament reconvene and a major debate take place concerning the attack on chemical weapons facilities in Syria. These attacks took place in a coordinated way by British, French and American forces and the reason for them was claimed to be the crossing of a ‘red line’ by Assad because of his use of chemical weapons in his latest attack. This led to calls for parliament to be recalled and considerable debate about whether we should have joined in the bombing. The Labour leader Jeremy Corbin called for a War Powers Act to be enacted to clarify when a prime minister could and could not engage in military actions. The death and destruction in Syria is appalling. The use of barrel bombs dropped on civilian areas has caused terrible damage and thousands of innocent citizens have been killed. The Syrian Network for Human Rights estimates that over 217 thousand civilians have been killed; over 13 thousand have been tortured to death and over 27 thousand children have been killed. Of those, 80% were killed by Syrian forces and 6% by Russians. These figures have been broadly supported by the Syrian American Medical Society and White Helmets, an aid agency working in the country. There has been universal condemnation including by the UN’s Secretary General. Meanwhile, in Yemen, another conflict is underway also causing considerable death and destruction. As we noted in an earlier post, thousands have died, cholera is widespread, and the country is being steadily bombed back to the stone age. Millions have been displaced and medical and other humanitarian supplies are prevented from entering the country because of a blockade. There has not however been much in the way of outrage from parliamentarians about this and no calls to recall parliament. It was claimed that the justification for the bombing of Syria was the crossing of the red line. This suggested that Assad had used chemical weapons for the second time and we had to send a message to deter him. One problem: it is not the first or even the second time he has done this. The SNHR estimate that he has used them on 207 occasions and on 174 occasions since the Ghouta attack. The very notion that a red line has been crossed is therefore not tenable as Assad has regularly used these weapons, on average three times a month. In addition to chlorine he has on occasion used Sarin. Tens of thousands of people have lost their lives or have lost loved ones in these terrible conflicts. The destruction of buildings will take decades to do and billions to repair. In one case we continue to profit from the supply of arms and roll out the red carpet to those who are responsible: in the other case we say a red line has been crossed – which it has on many, many occasions – and bomb the country. A terrifying and sickening report on the execution of possibly 13, 000 Syrians is published in a major report by Amnesty. The report makes chilling reading as testimony from survivors and guards describe the horrific process of killing and disposal of bodies by the regime. A summary of the report is published in the Guardian today. There is also a piece by Kate Allen, director of Amnesty describing the prison as a slaughterhouse. 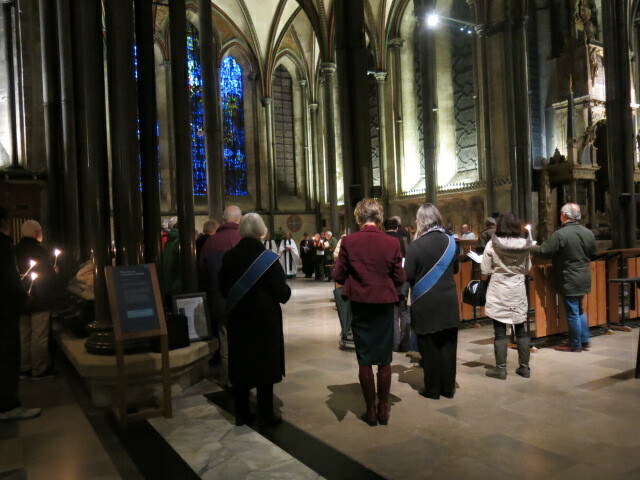 On Monday 22 November we had the annual evensong for Amnesty International. We are delighted to work with Salisbury Cathedral on this event, which has been running for a number of years now, especially as it ends in the Trinity Chapel where the Amnesty candle is situated and under the Prisoner of Conscience window. This evening we hear one of the uglier Christmas stories. When the wise men visit local ruler Derod, they say the are looking for ‘the King of the Jews’, and he realises that they don’t mean him. Herod judges – rightly – that Jesus, the child they seek, is a threat to his kingdom and to his way of doing power. And so, says Mathew the gospel writer, Herod begins some targeted slaughter to neutralise this potential source of rebellion, and Jesus and his family must escape as refugees. a tendency to talk about you as part of a lump, a collectivity, an issue, a problem, not a person with a story. Throughout its 55 years, Amnesty – to the vexation of the Herods of this world – has tirelessly brought into the light the stories of people whose rights are abused, people like a teacher in Indonesia who we are supporting with our prayers during this month. Groups like Amnesty International patiently and persistently bring to the minds of rulers and their representatives the stories of people they would rather forget. And now, as our continent faces the severest displacement of people since Second World War, refuges are at the top of Amnesty’s concerns. On Amnesty’s website you will find a short film called A Powerful Experiment. According to the psychologist Arthur Aron, four minutes of eye contact is enough to bring people close together, even to fall in love. And so, in a bare factory space, a group of native Europeans – women, men, and one girl – each sit with a refugee for four minutes. In that space and time the ‘issue’ acquires a human face: Samira from Syria and Danuta from Poland and Fatima from Somalia: they open their eyes and at first just look at each other. Soon the are smiles – warm or perhaps shy – some tears, then words ‘nice moustache. I’m sixty-five. Are you new in Berlin? Eight months. And are you alone here or with your family? Alone. And finally, touch – a handshake, a hug, a game of It, and that word ‘refugee’ is made flesh. In just four weeks’ time, we shall proclaim again the good news of the word of God made flesh and the birth of Jesus. The Christmas stories will remind us how glorious is the full ness of God: how infinitely treasured is each human life, made in the image of God. And tonight we give thanks to God for Amnesty, for the patient, persistent work of its staff and volunteers in reminding the powerful of this treasure and how blasphemous it is to deny it; and reminding us all that the refugee glimpsed on a screen or news page is bone of our bone and flesh of our flesh, that each one, like each of us, has their story to tell. Around 80 people attended which is fewer than usual but the bad weather would have deterred many. 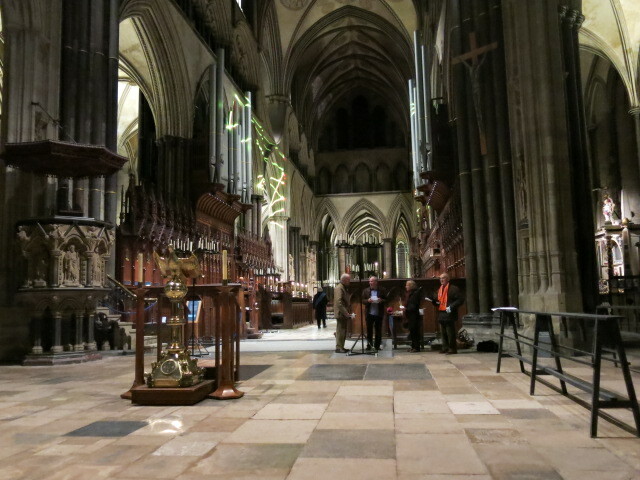 Our thanks to Cathedral staff for their help with this event. The problems of Syria and people fleeing that country are seldom out of the news these days and indeed, the issue of immigration – and immigrants from Syria are part of the problem – is high up on the agenda with the debate about Brexit or Remain in the European Union. Many people are responding in interviews that the reason they want us to leave is to stop the flow of refugees and immigrants coming to the UK. All the talk about ‘immigrants’ can sometimes cloud the fact that these are people we are talking about and people means children as well. Children who may have witnessed terrible events and even have lost parents in the conflict. So a talk being organised by the Romsey group of AI is timely. They have invited someone from Firefly International to give a talk on Monday 20 June starting at 19:45. It will be about the conditions in Southern Turkey and their projects for children in that area. It will be in Abbey Hall, Romsey, SO15 8EL. It is reported today that the government’s use of drones to kill people overseas is to be reviewed by the Human Rights Committee. This is welcome news. Clearly, ISIS is an unpleasant organisation and is acting in a brutal and uncivilised way. When it was revealed that a drone was used to kill two people in Raqqa in August, David Cameron said it was done as an act of ‘self defence’. Quite how someone in Syria was a threat to the UK was not explained and seemed very unlikely. Earlier this week is was reported that the government was removing adherence to international treaties from the ministerial code. It is these treaties which prevent use of force without UN sanction or because there is a genuine need for purposes of self defence. We look forward to some serious questions being asked of ministers. its guidance on Eritrea is based on a careful and objective assessment of the situation in Eritrea using evidence taken from a range of sources including media outlets; local, national and international organisations, including human rights organisations; and information from the Foreign and Commonwealth Office. However they have relied largely on a Danish report, the authors of which have disowned for its misinterpretation, and Eritrean government sources, rather than the reports of human rights groups. Following its independence in 1991, the country has lapsed into a total disregard for the rule of law. Elections have been regularly postponed – President Isaias Afeworki has never faced the electorate – arbitrary detention is rife; torture is so common that the Commission concluded that it was government policy, and mass surveillance and neighbourhood spying is the norm. Justice is arbitrary, detention conditions are appalling, and complete disappearance not unusual. 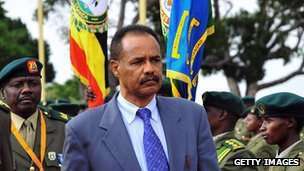 So far, so typical dictatorship but in Eritrea it is egregiously appalling. The speciality of the state is that, under the pretext of defending the integrity of the State and ensuring national self-sufficiency, much of the population is subjected to open-ended national service, either in the army or through the civil service. When they turn 18 or even before, all Eritreans are conscripted. While national service is supposed to last 18 months, in reality conscripts end up serving for an indefinite period, up to 20 years in extreme cases. Thousands of conscripts are subjected to forced labour that effectively abuses, exploits and enslaves them for years. Women conscripts are at extreme risk of sexual violence during national service. The use of forced labour is so prevalent in Eritrea that all sectors of the economy rely on it and all Eritreans are likely to be subject to it at one point in their lives. The commission concludes that forced labour in this context is a practice similar to slavery in its effects and, as such, is prohibited under international human rights law. The Eritrean Foreign Ministry inevitably claimed the Commission’s report contained ‘wild allegations’ which were ‘totally unfounded and devoid of all merit’ and charged the UNHRC of ‘vile slanders and false accusations’, without addressing any of the issues. The British government have since modified their stance based on Eritrean assertions that military service will be limited to 18 months to 4 years, which would render it legal, but there is no evidence of this happening. These widespread abuses have prompted thousands of Eritreans to flee their home country in search of asylum in Europe. According to the latest estimates produced by Italian authorities, 32,000 Eritreans were rescued in 2014 as they attempted to traverse the Mediterranean – the majority of all migrants rescued by Italy’s comprehensive Mare Nostrum operation. Meanwhile, the UN refugee agency has placed the number of Eritreans under its concern outside the country at more than 357,400. This is the country we are intending to return refugees to as being “safe”. The Government needs to think again.